A Very Short Introduction. New York: Oxford University Press, 2012. 160 pages. This pocket-sized, 137-page book is part of the series of “Very Short Introductions” published by Oxford University Press. Covering a literary history of more than three thousand years is a daunting task to begin with, and doing so with such a stringent space allotment is almost inconceivable. Anyone who is willing to take on such a project is either foolish or astute. Knight clearly is the latter. Her approach is smart and sensible, with the right balance between brief summaries of general trends and probing analyses of a few major texts. 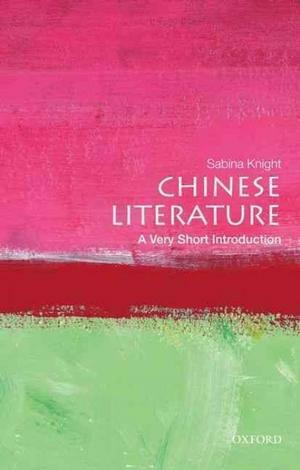 Throughout the book, Knight shows critical acumen and presents clear arguments, all the time keeping an eye on the major concerns of Chinese literary culture even as she provides detailed readings of individual texts. The book is organized in five chapters: Foundations; Poetry and Poetics; Classical Narrative; Vernacular Drama and Fiction; and Modern Literature. This structure, in comparison with a strictly chronological arrangement typical of literary histories, has the advantage of creating a sense of continuity and dialogue across multiple periods and genres. The first chapter, a well-argued treatment of classics, begins with the famous fish parable in Zhuangzi, which advocates the acquisition of a broader perspective, a concept “shared by all the major schools of Chinese thought” (2). To illustrate this point, Knight goes into an explication of the Chinese writing system, and Confucian and Daoist classics, highlighting the role of the literati in transmitting and transforming Chinese culture, since “China’s survival over three thousand years may owe more to its literary history than to its political history” (3). The second chapter, packed with many insights and a forcefully articulated point of view, focuses on classical poetry, which, according to Knight, “offered ways to find meaning amid time’s transience, regulate bodily energies, and cultivate benevolence.” (26) Knight pays careful attention to the broad historical and cultural circumstances under which poetic works were produced and appreciated, providing judiciously executed assessments. Rarely does she fall short in demonstrating the full social and cultural implications of a work, with the exception, perhaps, of the comment on Tao Qian, whose reputation, according to Knight, “was established by Song-dynasty neo-Confucian scholars who appreciated his poems’ relative freedom from Buddhist influence” (41-42). The Song neo-Confucian scholars were indeed crucial in canonizing Tao but to attribute their enthusiastic endorsement of his work to an aversion to Buddhism is debatable. We know that although neo-Confucianism rejected Buddhist metaphysics, it also incorporated Buddhist terminology and ideas. Furthermore, it was Mei Yaochen and Su Shi—hardly representatives of neo-Confucianism— whose glowing appraisals launched the campaign to elevate Tao’s stature. Another minor point to be raised about this chapter concerns translation. Knight provides a much-appreciated word-for-word, literal translation of Du Fu’s poem “Spring Gazing.” Literal translations, however, are prone to imperfection, as reflected in Knight’s choices for the last line: “渾慾不勝簪,” where “渾” (completely/simply) is rendered as “confused” and “勝” (to bear/support) is translated as “triumph.” Knight’s elegant translation of the line reads “Soon too sparse/ to hold my cherished hairpin in”; but a bilingual reader might wonder what has happened to “confused” and “triumph.” Knight’s translation would arguably benefit from a footnote indicating that, in the Chinese language, a single character often contains multiple meanings and the particular meaning being foregrounded in a text may or may not be the first or the most obvious one glossed in dictionaries. This would also bolster some of her other helpful comments on the nature of C hinese poetic language. The third chapter deals with a wide variety of prose writings, including historical narratives and belles lettres (essays and jottings), as well as short stories of “strange” and fantastic nature. By including historical narratives as wenxue (lit., “the study of writing” or literature), Knight makes an important point in keeping with Chinese practice prior to the late nineteenth century. She underscores the function of early narratives as record keeping and moral teaching, and her extensive list includes historical narratives such as Zuo’s Commentary 左傳 (a.k.a., The Chronicle of Zuo or The Commentary of Tso) andThe Historical Records 史記 (a.k.a., Records of the Grand Historian); supernatural or marvelous tales found in Classics of Mountains and Seas 山海經 (a.k.a., The Classic of Mountains and Seas), In Search of Spirits 搜神記 (a.k.a., In Search of the Supernatural), and Strange Tales from a Leisure Studio 聊齋誌異 (a.k.a., Strange Tales from a Chinese Studio); and tales of the mundane, such as those collected in New Accounts of the Tales of the World 世說新語. These texts are wildly diverse in theme and style; the only features that bind them together are their relatively short length and their use of classical or literary language. Indeed, there is little in common between Pu Songling’s fantastic tales and Sima Qian’s historical records. Therefore, it might make sense to consider separately the ostensibly fictional narratives such as “The Story of Yingying” and “Jiaona” (a.k.a., Jiaonuo), two stories Knight treats at length. On the other hand, Knight’s decision to examine drama and novels in Chapter Four, is theoretically sound, as these two genres developed from the same story-telling tradition in which the use of vernacular language is a prominent feature. In the section of oral a nd dramatic performances, some of the best-known titles are discussed in relative detail, such as Peony Pavilion 牡丹亭 and Peach Blossom Fan 桃花扇. Popular short stories collected in Lasting Words to Awaken the World 醒世恆言 and Pounding the Table in Amazement 拍案驚奇 are briefly mentioned. Full-fledged novels of the Ming and Qing dynasties receive more extensive treatment, particularly the masterpiece Dream of the Red Chamber 紅樓夢 (a.k.a., The Story of the Stone). In addition to introducing the plots and themes, Knight also touches on critical debates and commentaries surrounding these works and examines several instances of intertextuality in which a later work makes use of characters and plots of an earlier work. In the final chapter, Knight makes shrewd use of Gao Xingjian’s play Bus Stop to frame the discussion of six themes of modern Chinese literature: nationalism, humanism, progress, memory, pleasure, and “cultural China.” This is a refreshing but risky tactic. While useful in making sense of a diverse body of texts, it appears to confine modern Chinese literature to these neatly packaged topics culled from the play. Even if one agrees that Gao’s Bus Stop possesses an extraordinary power of vision, the idea that a single text can serve as a guidepost for navigating a century of literary production is not entirely convincing. In general, however, the thematic approach serves Knight well. Since a book of this size cannot possibly be thorough, the best way to compensate for its inevitable incompleteness is to develop overarching arguments that encapsulate a genre or a period, which Knight has done admirably. As an introduction to Chinese literature, this little book has accomplished its big mission. The scope of coverage is impressive, and the skill with which Knight makes the mountain of material cohere is remarkable. Although written for the general public, it could be of interest to students or even specialists in the fields of literature and intellectual history.